With the cost and waste associated with bottled water, home water filtration systems have grown increasingly popular in recent years. PUR water filters vary in design and type, depending on the filtration system. Knowing how and when to change your PUR filter will ensure the system continues to provide you with clean, healthy water. How often you need to install a PUR replacement filter depends on the specific type of filter being replaced, how often you use it and the quality of the water being filtered. Water filters need to be replaced more often in large or busy households, for example, or when the tap water contains a large amount of contaminants that quickly clog the filter. Some models and styles are capable of filtering greater amounts of water before requiring replacement. 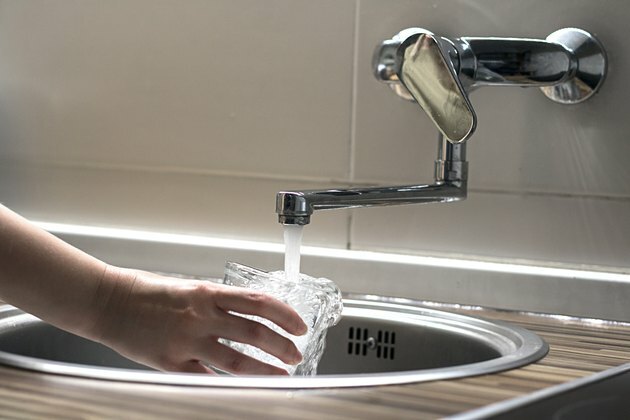 Tap water contains potentially harmful contaminants, such as heavy metals, microbes, industrial pollutants and trace levels of pharmaceuticals. PUR water filters contain an activated carbon microfilter to reduce these contaminants in your drinking water. The system also eliminates the odor and taste of chlorine while preserving valuable fluoride content. A PUR filter replacement should be installed every 100 gallons or approximately every two to three months. An indicator on the filter housing alerts you when the filter needs to be changed. To change the filter, remove the housing cap, pull out the old filter and install the new filter in the same direction. A damp rag makes a handy grip for loosening stubborn housing caps. PUR pitcher filters are effective for filtering up to 40 gallons of water. Replace pitcher and dispenser filters roughly every one to two months, depending on your household size and frequency of use. Some models feature an electronic light indicator on the lid. Replace a PUR pitcher or dispenser filter by removing the lid from the vessel, pulling out the old filter and installing a new one in its place. Depending on the refrigerator model, PUR refrigerator filters effectively filter between 100 to 200 gallons. These filters should be replaced every six months. The filter is located at the bottom of the refrigerator and may have a push-button for removal. Push this button to eject the old filter then remove the grille cap from the end of the filter. Twist the grille cap onto the new filter and insert the filter into the refrigerator. For models without a push-button, you must first turn off the ice maker. Twist the filter clockwise to remove it. After transferring the grille cap from the old filter to the new filter, insert the new filter into the refrigerator and twist it clockwise to install it. Don't forget to turn on the ice maker afterward. PUR water filters have an indicator light to take the guesswork out of determining when to replace them. A green indicator light means that the filter works correctly and does not need to be replaced. A yellow light informs you that the filter will soon need replacement. The yellow light will begin flashing to warn you that it's now time to buy and install a new replacement filter. If the indicator light turns red, it means the filter can no longer clean your water. Drinking water from a PUR filter that has a red light is the same as drinking water straight from the tap, without filtration. Once you replace the filter, the indicator light will not automatically return to green. You need to press the reset button and hold it for five seconds. This should reset the indicator light. Matthew Ferguson is a writer living in Savannah, Ga. He has been writing for over 10 years and his work has appeared on various online publications. A collection of his short stories was published in spring 2010. He is a graduate of Appalachian State University. Will a Refrigerator Work Without a Filter?